The name of “The Basics” is also an illusion to this casual eatery’s philosophy, which is to serve up all the stales of southern comfort food, keep it simple, and let the inherently rich and wonderful flavors shine. Considering their dedication to authentic southern cuisine, The Basics has a perfect location. 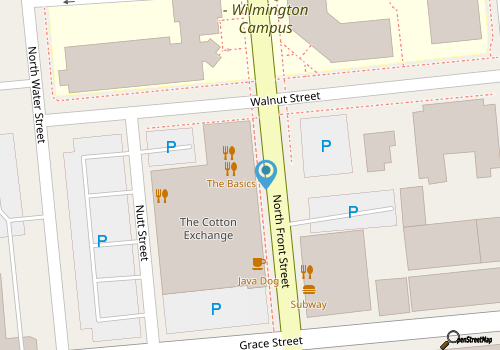 Found within the Cotton Exchange – a historic shopping center in the heart of Downtown Wilmington – The Basics is a nice stop for area shoppers who want to pause and satisfy a big appetite. Featuring varying menus for breakfast, brunch, lunch and dinner, patrons will have plenty of southern options to choose from, depending on the time of day. Breakfast and brunch fans can treat themselves to fried chicken biscuits, southern grits or “Southern Benedict” with smoked ham and sausage gravy, while lunch visitors can start a meal with fried green tomatoes or fried oysters, and then enjoy a decadent sandwich, like the grilled pimento cheese, oyster po’boy, or the fried chicken BLT. The dinner menu is just a little heartier, with classics like cider-marinated pork chop and smoked pork BBQ next to more modern entrees like the pesto-encrusted salmon and vegetarian risotto. Elevating southern dishes to their best, The Basics is introducing newcomers to how great southern cuisine can be, one dish at a time. Call (910) 343-1050 for current hours.